(Reuters) National Football League Commissioner Roger Goodell on Wednesday announced a new policy that will fine teams an undetermined amount if players on the field fail to stand during the national anthem played before the start of the game. Some NFL players chose to kneel during the anthem last year to protest police shootings of unarmed black men, stirring a controversy as President Donald Trump criticized the players for being unpatriotic. 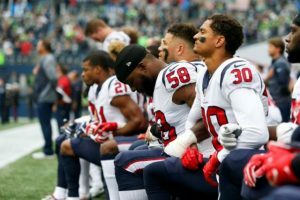 The league’s new policy no longer requires players to be on the field during the anthem, allowing any players who wish to protest to remain in the locker room. But the players’ union, the NFL Players Association, said the league chose not to consult the union and that it may challenge the new policy. “Our union will review the new ‘policy’ and challenge any aspect of it that is inconsistent with the collective bargaining agreement,” the NFLPA said in a statement.